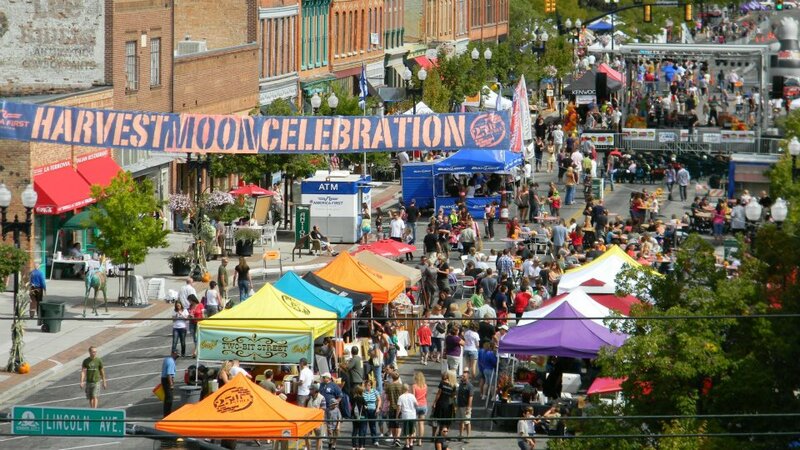 Harvest Moon Celebration to Conclude Ogden Summer Festivities Ogden, Utah – Historic 25th Street Business Association presents the eleventh annual America First Credit Union Harvest Moon Celebration to mark the culmination of summer. 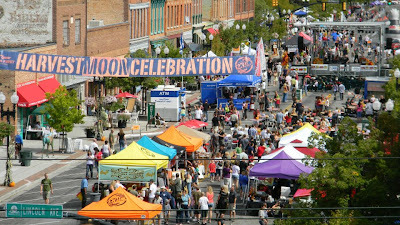 Harvest Moon, one of Utah’s largest outdoor celebrations, will take place on September 22, 2012 from noon until 10 p.m. The festivities are held in conjunction with the XTERRA Off-road Tri and Trail Run Nationals in Ogden. An estimated 10,000 community members, families and athletes are anticipated to attend. The schedule of events consists of more than 25 free family-friendly activities for all ages, arm wrestling competitions, live music, a downtown criterium, and the commemoration of the 150-year anniversary of Union Pacific. Arm wrestling tournaments will take place throughout the day at the intersection of Lincoln Ave. New this year, pets will not be allowed on the street, with the exception of service animals. Free kid's activities will take place from noon until 5 p.m. including pumpkin painting, the Tumble Bus, face painting, balloon art, a bubble pad, mini train rides and many more. Community partners such as the George S. Eccles Dinosaur Park, the Eccles Community Art Center, Weber Pathways and the Tree House Children’s Museum will provide activities. Downtown restaurants will take their offerings to the street. Participating restaurants are Tona, Bistro 258, Roosters, Rovali’s, Two Bit Street Café, jásoh!, MacCools, Canyon Market Grill and The Garden Grille and Lounge. Snow cones and snack food will also be offered. A beer and wine garden will be available for the 21 and older crowd. Local and national performers will take the stage on 25th Street from noon until 10 p.m. That evening, headliner Matthew Moon, will perform at 7 p.m. During the event, Union Pacific will highlight Ogden’s rich legacy as part of the railroad’s 150th anniversary. The company’s legendary Steam Locomotive No. 844 will roll into the Union Station, pulling its popular traveling museum titled Promontory. XTERRA Off-road Tri and Trail Run Nationals will occur in conjunction with the event at Snowbasin Resort. XTERRA will host a highlight presentation and awards ceremony honoring the race’s champions during Harvest Moon from 8 to 8:30 p.m. Sponsors of the Harvest Moon Celebration are America First, KBER, Downtown Ogden Inc., RAMP, Budweiser, Miller Coors, Swire Coca-Cola, Ogden’s Own Distillery, Only in Ogden, the Standard Examiner and Sam’s Club. A special thanks to the Historic 25th Street Business Association Advisory Board: Snowbasin, Marriott Ogden, Amer Sports, Downtown Ogden Inc., Ogden City, Ogden/Weber Convention and Visitors Bureau, Zions Bank, Roosters Brewing Co and Restaurant, Ogden/Weber Chamber, Union Station Foundation and Swire Coca-Cola. For additional information visit www.historic25.com or call 801.644.4068.